Description:Grant Wood's trunk was a family heirloom that traveled with the Wood family from Virginia to Iowa. Grant Wood inherited the chest from his aunt. Originally designed for ladies' hair pieces, this trunk was used by the artist for his receipts and important papers. It was confiscated by the IRS during an investigation of back taxes from 1935-38. 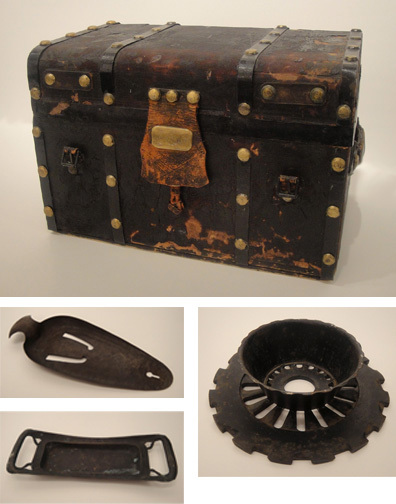 The trunk is accompanied by three metal objects created by Grant Wood. Metalwork was a hobby for the artist. These pieces, from the collection of his sister Nan Wood, were created during his time at Turner Alley. An avid lover of hazelnuts, Wood fashioned the rectangular tray to fit on the artist's easel for easy access. The round metal object was created for his mother, Hattie, to use as a flowerpot holder. The heavy design, crafted from the iron gear of a sead planter, was inted to counteract her post blowing off the window sill. The tapered object appears primarily decorative; it hung on the porch post of Grant Wood's Iowa City home.